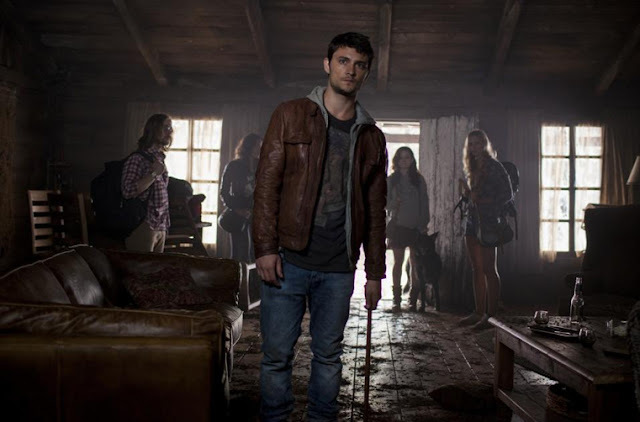 Synopsis: David (Fernandez) and his girlfriend head to his old family cabin to join his sister Mia (Levy) and their friends, Olivia and Eric (Lucas & Pucci), in an attempt to help Mia kick her drug habit. When David's dog discovers a bloody mess leading down to the basement, the group stumbles across a gruesome scene...and a book covered in human skin. Eric's curiosity gets the best of him and he reads from the book despite its warnings not to, unwittingly releasing a demon that possesses Mia and causes all hell to break loose. Even though Raimi's original doesn't get my heart pumping, I NEEDED to see this remake when the opportunity presented itself. All I needed to sell me on it was the blood-soaked red-band trailer. HO-LY CRAP. I was also intrigued by reading Sam Raimi explain that while this movie is certainly a remake of the original, he also sees it as a sequel set 30 years after the original. I could jive with that. So what did I think of Evil Dead? I loved it. I absolutely loved it. Whereas the original has some scares but is pretty campy, you'll find absolutely no camp with the feature-length directorial debut of Uruguayan director Fede Alvarez. After a pretty effectively disturbing prologue that sets up the terrors our quintet of beautiful people are going to experience, I really dug the set-up for the film and the following execution of the plot. The movie really starts strong introducing our characters - estranged siblings Mia (Suburgatory's Jane Levy) and David (Shiloh Fernandez), their friends Eric (Lou Taylor Pucci) and Olivia (Jessica Lucas), and David's girlfriend Natalie (Elizabeth Blackmore) - by having the five of them retiring to Mia and David's family cabin in the woods to help Mia kick a heroin addiction. If there is any reason to go to a remote cabin in the woods, that's probably one of the best realistic ones you could come up with. And what this ploy does is allow for some realistic confusion when Mia becomes the first to get possessed - the audience knows what's going on, but her friends and brother just think she's going through withdrawal. Neat. cabin in the woods a novel one,but the set design was top-notch, too. But while the initial set-up earned marks for me, one of the very few reasons this movie isn't going to get a 5-out-of-5 from me is because it carries one of the weaknesses of the original: when the group finally finds the Book of the Dead - despite the book being stashed away in a room full of dead cats, wrapped in a garbage bag and then wrapped again in barbed wire, with tons of scribbles throughout its pages saying things like "DO NOT READ ALOUD" and the like - WHY does Eric go on to open the book and read the very incantations the book is saying NOT to read? It's one of the classic horror movie cliches to drive the plot forward, but it feels particularly forced this time. All of that said, when the crap hits the fan following Eric's dumb move, Alvarez and Co. really put the pedal to the metal. Evil Dead is a GORE-FEST. Just buckets and buckets of blood and nasty, cringe-inducing things happening to our protagonists. It's relentless and honestly, I'm very surprised they got away with an R-rating for this final cut. But I'm glad it did. It's because Alvarez keeps pushing and pushing with the gore that made me love this movie. They very easily could have just rehashed the things that happened in the original but, for the most part, they go with original thrills and kills (with the occasional nod to the older flicks such as a certain wood-cutting instrument). And the best part about the gore is that it's all practical effects! Gotta love old-school film-making. So that's the main thing Evil Dead has going for it. It's one of the goriest films I can remember in the last few years, and it has plenty of moments that made me and the fellow horror fans I bonded with who sat next to me at the screening sit back and go, "No, no, no, no..." BUT...the other reason I need to mark the film down a little bit is because it lacks tension. At no time was I ever really scared or terrified like the marketing says I should've been. But I can see how some of the general public that will go see this might be, because this is definitely not your usual horror movie. So while I didn't find it necessarily terrifying, I did find it unnerving. One of the strongest aspects of the film is the score by Roque Banos and the sound editing, which combine to give the movie an ominous tone (I loved a part where they used an air raid siren). There's also a particular scene with a character mutilating themselves somehow, but you don't see them doing it, you only hear it and see it's results. That was effective. As was the sound design of what the possessed Mia sounded like - very reminiscent of Linda Blair's Regan in The Exorcist. Little things like that really added up to make this an effective horror film. Jane Levy's Mia goes through the ringer in Evil Dead, and throughout the entire film she does a fantastic job. Last but not least, I need to mention that I felt the lead actors were solid but not great...except Jane Levy. I read just prior to seeing the film that Levy was NOT originally cast in the role of Mia, but that Lily Collins (Mirror Mirror) was supposed to play the part and dropped out. And I'm very thankful that she did because Levy knocks it out of the park. From her creepy wide-eyed look as the possession starts to her mannerisms and performance in full possession, I thought Levy did a fantastic job in a tough role. The other actors are fine for what they have to do and the script lets them down a few times, but those things get wiped away once the blood starts to run. 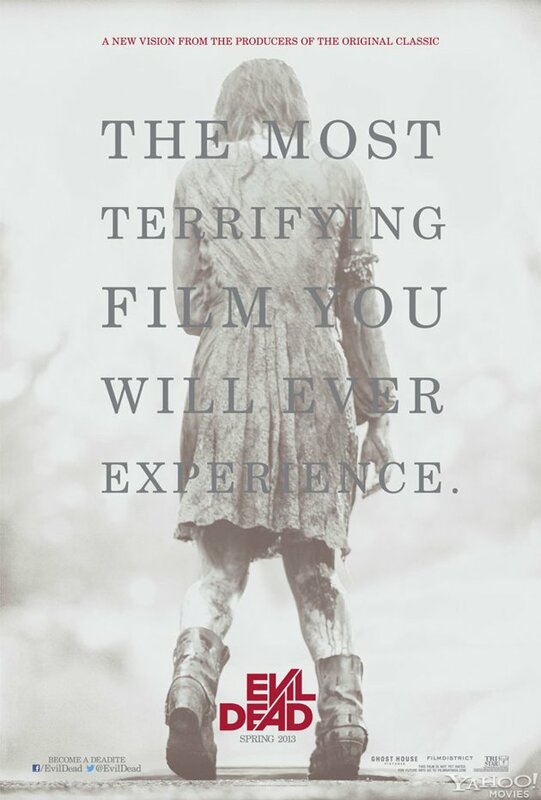 I highly recommend Evil Dead, whether you're a die-hard horror fan or a casual one. I fully expect this film to be a big hit and I'm excited to see where the franchise goes from here, and I might even go back and see it again while it's in theatres, which is one of the highest compliments I can make for a movie.